I am pleased today to present you to Ocenahorn made by FDG Entertainment I am very happy to see this game because it reminds me about The Legend of Zelda. And as we know this game on NES brought a whole new genre to the world of games. It is very nice to see such a game on mobile devices. “Pocket Zelda” is maybe a right nickname for this game. The story of Oceanhorn isn’t all that interesting or important. You play as a boy who wakes to find out that his dad has set out to kill Oceanhorn, a mechanical monster that has terrorized the world they live in. You set sail (literally) to find and help him. Thankfully the sailing here is mostly automatic aside from aiming a gun (which you can only use on the boat for some reason) at some enemies, and obstacles; a process that is over in no time but quickly grows tiresome thanks to how often the game forces you to do it. There’s a decent amount of islands to discover, all of which can be explored to their fullest in around 12 hours. The islands can consist of repetitive beachy overworlds, caves, dungeons, and, of course, a graveyard. 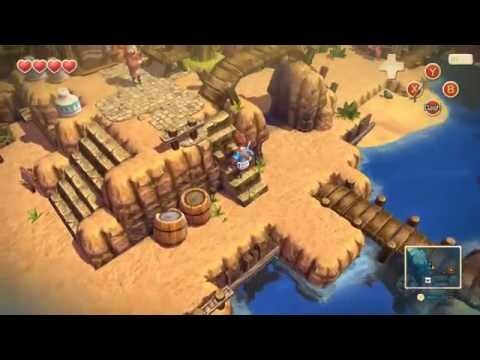 Variety is not Oceanhorn’s strong suit as nearly every island consists of the same handful of enemies and textures. And now let`s talk about the gameplay. The combat mechanics are very simple, consisting of swinging your sword, throwing bombs, shooting arrows, and blocking. Thanks to some basic AI most enemies can be taken down quickly just by running up to them and mashing the attack button, which I guess is understandable considering the original version of the game was made for touchscreen devices; that doesn’t mean it is all that fun. A few other minor annoyances include having to use a menu to switch items when doing so on the fly could have been easily assigned to the shoulder buttons, and checkpoints right before one of the few bosses that force you to watch their introductions each time you die by their hand. Amateur mistakes, if I do say so myself. Worse is that there is a stamina meter for running, swimming, and eventually jumping and rolling. This meter takes far too long to refill and runs out quickly, and the same can be said for the mana meter which requires you to smash pots or kill enemies to refill. Pots respawn whenever you enter and exit an area, allowing you to easily refill your mana, so having the meter at all is pointless and stamina only serves to slow down the player’s progress. Two outdated and not at all fun gameplay elements I hope developers stop using, immediately. So, in the end, I think that this is a good game. The flash from the past to the Legend of Zelda and Links is something that hit the soft spot. If you are a fan of NES I am sure that this game will be great for you. If you don`t know what I am talking about still get it.